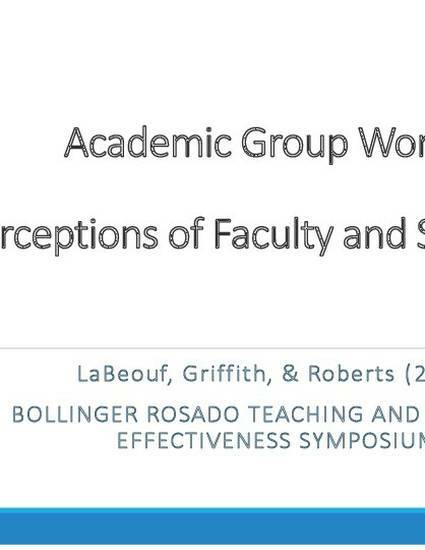 Embry-Riddle Aeronautical University researchers analyzed 811 (118 faculty and 693 student) comments from open response areas of a survey to determine the perception of faculty regarding group work in the academic setting. The biggest issue noted by both groups was allocation of grades for group members. Students perceived that all students received the same grade in a group project, regardless of effort. Most faculty did not share that perception, but noted difficulties in assigning group grades as well. Faculty and students described difficulties encountered by students when working on group projects in online or distance learning settings due to limited interaction and time zone differences and/or different work schedules. Faculty and students also encouraged faculty to closely monitor group projects and mentor students through group formation and goal setting. While there is general consensus that group work in the academic setting may have experiential value, there remains concern about the group process itself as it is understood and used by both faculty and students. Recommendations include future research on age, gender and ethnic background relative to group projects, and case studies identifying best practices and identification on where group projects should be placed in a college curriculum. This study should also be replicated in three to five years due to changes in technology that impact course design, delivery and blended learning formats. The authors would like to thank the Embry-Riddle Aeronautical University Institutional Research Office for their support of this project.